Materials: Durable pigskin leather, Heatkeep thermal liner. Also features: spare cash for rent. There's no beating around the bush, skiing is expensive. From backcountry touring gear and safety equipment, to Gore-Tex outerwear and $100 lift tickets… It's hard to catch a break. So why would you purchase gloves that range upwards of $200? For around $20 and a bit of Sno-Seal ($8), Kincos–those handy dandy work gloves at your local hardware store–keep you warm and dry. After all, gloves are either going to get lost, wiped with snot, or will have beer spilled on them. I didn't realize the importance of functionality in gloves until I started ski coaching my first year in college. Perhaps it made sense that at the time I was also more responsible for keeping some cash in my pocket. It was then I found inexpensive leather gloves, ultimately finding even cheaper ones, Kincos, at the hardware store. As I tuned into them, I realized all of the older mountain ops folks were rocking them, too—a testament to my young ski bum find. They're warm and functional, be it working in the snow or fiddling with gear, and when properly baked with Sno-Seal are fairly waterproof. Plus, they're inexpensive, which is why I've trusted them for years. Recently, I picked up a pair of Kinco's Ski Mitts to complement my normal gloves on those super cold days. Kinco offers a variety of options from lined grain pigskin leather palm work/ski gloves, simple pigskin leather ski gloves and mitts, and a cold weather ski glove—the 900Max, to High-Vis pigskin leather gloves with waterproof inserts. The High-Vis option adds some steeze into mix and I've been using these for the last several years. 1. Preheat your oven to 120-150 degrees. Sno-Seal suggests 120, but I run it a bit higher. However, 155 degrees is Sno-Seal's melting point, and that’s no good. You want it to bake in. My oven's lowest setting is 170, so I keep the door cracked open. Also, turn on your kitchen fan. 2. 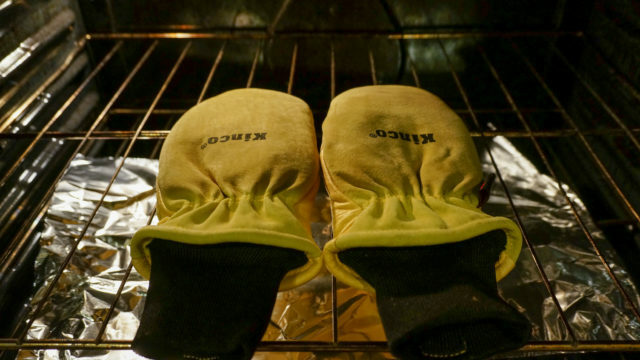 Place the gloves in the oven and warm for five minutes. 3. Crack your favorite beverage. 4. 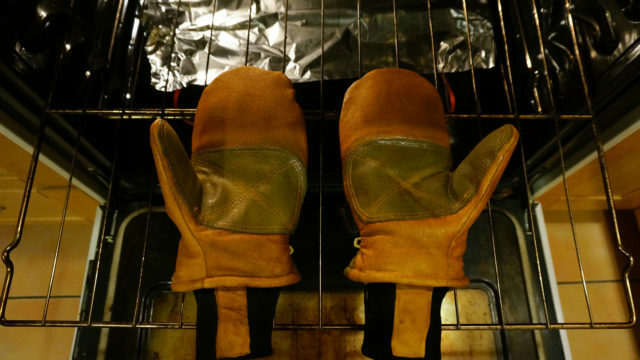 Pull the gloves out of the oven and put them on. Then, as if you're washing your hands, grab some Sno-Seal and coat the gloves. You can either place them on a sheet of foil, or place the foil below in case the coating drips. 5. Place them back in the oven for five minutes. 6. If the gloves have a dull appearance, repeat steps three and four. Typically two to three bakes will get them sufficiently waterproofed. They’re done when they get a slight shine. 7. Take them out of the oven and let them cool down. They'll break in over a couple uses and you'll be psyched with your tough and water-resistant glove for less than $30.